The fact that you are here probably means that you already know that online reviews are important in today’s business environment. In fact, 90% of consumers admit to being influenced by them when making purchasing decisions and 84% state that they trust them as much as they do the recommendations that they get from their friends and family. So, what are the best tools for collecting online reviews? If you have been gathering reviews for any given amount of time, you will have noticed that the process is not as simple as it may appear at first. That is why it is so important for you to have as many collection tools as is possible to make your online reviews gathering effort a success. Indeed, the availability and range of collection tools is something that you need too seriously take into consideration when signing up with an online review syndication company. After you have done business with your clients, how are you going to begin the process of gathering reviews from them? Should you even ask for feedback, and if so, when is it the most appropriate time to do so? One of the companies that we recommend to businesses that reach out to us when it comes to the collection of online reviews is Shopper Approved. This company has one of the widest ranges of collection tools that can be found out there, and we are going to use it as an example in this article. 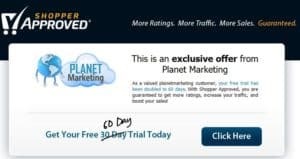 If you want to sign up with Shopper Approved today, the good news is that you can do so at a discount using the Planet Marketing link. Not only that, but you also get a 60 day free trial period when you sign up using our link. So, what are you waiting for? Sign up today to start benefiting from Shopper Approved’s wide unparalleled collection and distribution tools. Email, is without doubt, the biggest tool that you can expect to use when it comes to gathering feedback from your clients. Shopper Approved allows you to send out emails to your clients at the appropriate time in the purchase matrix. Remember what we have just been saying about the issue of timing? Research indicates that the best time when it comes to gathering reviews is when your customers have just received their products. For really large businesses, it may not be possible to manually send out an email to each and every customer. Just think Amazon as an example. The good news is that Shopper Approved allows you to automate the process of gathering reviews, ensuring that you do not spend so much time on the effort. Once a customer has made a purchase, an email is then send to them after an appropriate amount of time asking for feedback. Again, this is something that you will notice on such big businesses as Amazon. If you have ever made a purchase on the platform, you would have received emails after a while asking you to leave a review. This is another tool that you can expect to use should you choose to sign up with Shopper Approved. Video has, over the past decade, become a big part of the activities that take place online. Collecting video testimonials is, therefore, important for your business. Video testimonials tend to be a lot more convincing when it comes to giving people information about your products and services. With much of the world’s interaction with the internet now taking place using mobile devices, the need for a mobile first approach to the gathering of online reviews can never be overemphasized. This is another area where Shopper Approved excels. Once you have signed up, your clients get the ability to leave feedback about your company using a mobile application. This is another tool that you can use to collect reviews from your customers. With Shopper Approved, you get the ability to add QR codes to your coupons, flyers and displays. When your customers scan on the QR codes, they can then quickly and easily review your business. If you are looking to get your customers to leave quick feedback about your business, then this is another great tool that you can use. With Shopper Approved your customers can write comments on the back of the receipts that you give them, thus providing you with invaluable feedback with regards to your business. So, what are you waiting for? Sign up with Shopper Approved today to get the first 60 days absolutely free of charge. What’s more, you also get a discount should you choose to sign up using our link.